It's pretty obvious from the video Coach Darren didn't read the complaint or if he did he doesn't understand it and/or is intentionally misleading his followers. In the video above Coach Darren says he is not a financial advisor or any kind of legal lawyer. Something painfully obvious when I looked at the outright scams he has promoted over the past five years. Last edited by ribshaw; 12-27-2017 at 12:44 AM. If someone is recruiting for something and has to bait you with the word scam there's a problem. Darren must have the same script writer as Charlie Scoville had when he was busted by the SEC. 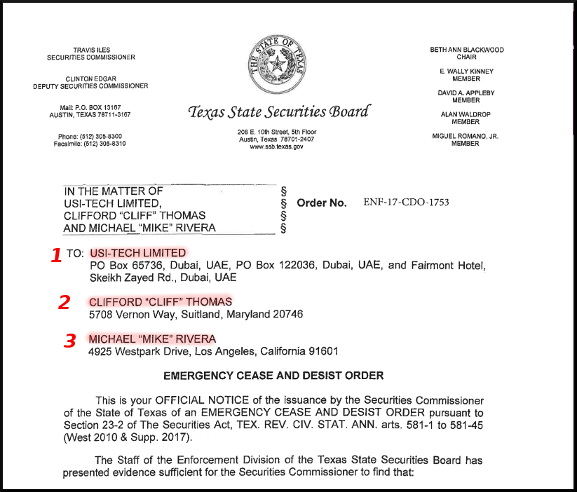 * Is the Cease and Desist aimed at two agents of USI-Tech or USI-Tech AND two of its' agents ??? * Is the Texas SEC alleging USI-Tech is a ponzi or pyramid as Coach Darren says ??? 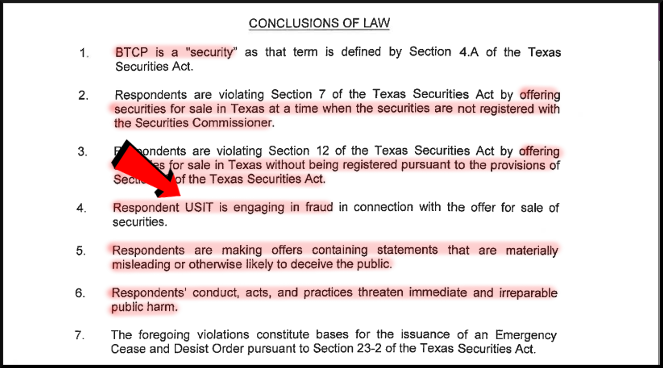 * Is the Texas SEC alleging the two agents have committed fraud ??? Coach Darren insults your intelligence in pretending that https://en.wikipedia.org/wiki/Ponzi_scheme operators don't lie about having external revenue. Of course there is an option to share with others while generating up to 35% commissions on 12 referral levels, like Charles Ponzi offered only more desperate. 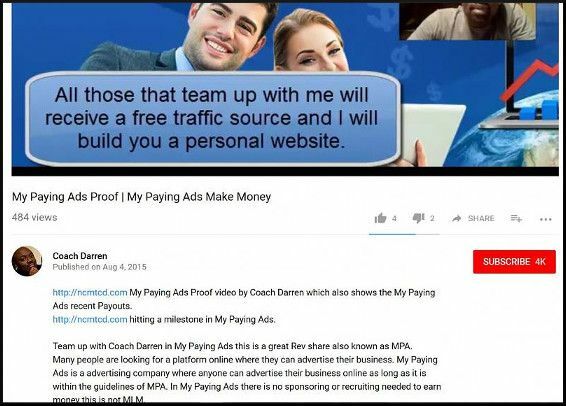 economybusters.net ALSO FIND Coach Darren on Facebook: http://facebook.com/durhammarketing AND TEXT OR CALL Coach Darren 254-289-6017 Is USI TECH A Ponzi Scheme or a SCAM or a Pyramid Scheme watch this video by Coach Darren and you decide. 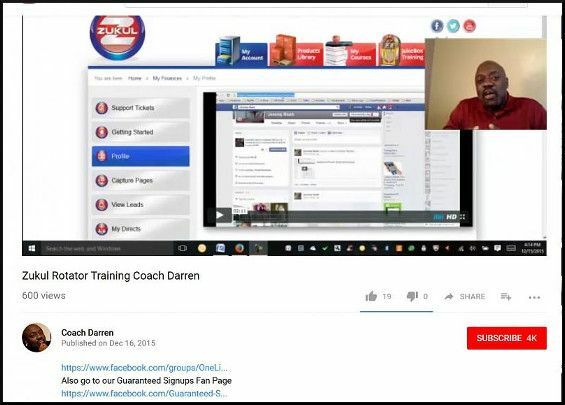 Coach Darren feelings is the USI TECH is not a Ponzi Scheme and it's not a SCAM or Pyramid Scheme. Darren's feelings would also dictate it isn't an investment because they try their darndest not to use the word investment. 2. Something called "American Bill Money" is to be taken seriously. Coach Darren is about as brilliant as William, the former serf for TM, Bryant. Same IQ and both are Ponzi pimps to the max. I think they both attended the same snow job academy and graduated with honors. USI TECH, Traffic Monsoon, My Paying Ads, are you starting to see a pattern? Of course these are/were all Ponzi Schemes, they are also unregistered securities in the eyes of the law. Coach Darren is violating multiple state and federal laws by promoting them. That doesn't necessarily mean he will be shut down, what is does mean is you will almost certainly lose money following his lead. If an investment opportunity is open to many people, and if investors have little to no control or management of investment money or assets, then that investment is probably a security. When a Ponzi Pimp like Ari Maccabi calls them a SCAM and reports that they have closed the accounts of fellow Ponzi Pimps Steve Lawson and J. Ryan Conley … I sincerely hope that no one on the planet is still on the fence as to whether TradeCoinClub is a SCAM or not. Just wow, talk about putting yourself, friends, and family at risk. Considering Coach Darren's whole BA video was about the compensation plan instead of retail selling, I strongly suggest current and would be MLMers read and digest this article. Desperate Darren sure can pick 'em. $2 into $40,000, if you believe that you deserve Coach Darren calling out your burpees. Imarketslive, there's something on your body that will get stretched to this size and it aint your wallet. I'm just going to come out an say it, if someone 12 seconds in has to explain to you how to subscribe to a Youtube channel don't quit your day job. In fact consider a second job as your prospects are that poor. Now ask yourself does Coach Darren not have a full time job promoting illegal scams? Good ol' Martin Ruiz, Eh ???? Nice company you keep, "coach"
Well thank heavens for guaranteed sign ups, the check is practically in the mail. Are we sure he's a "coach" and not a "couch" ??? Perhaps my favorite Ponzi tagline of all is "you don't need to sponsor" which always comes from people that do noting but sponsor. Of course sponsoring is necessary, where the hell you tink the 5% weekly payoffs are coming from if not new sponsors? When enough people that weren't sponsored stop putting fresh money in what happens every single time? Easy Cash Code, not to be confused with Easy 1 Up. Yep, you're going to send $18 and will never have to work again. That's exactly how life works. This whiteboard presentation best illustrates how Coach Darren's "opportunities" work. There are three circles at the top with lots of money in them, your money but not your circles. Below those circles are smaller circles with less money, still your money but not your circles. See those empty red circles of nothingness, take as many as you like. Coach Darren strikes out again. In baseball, what do they call it when someone comes up to bat 100 times and strikes out 100 times ??? Whatever it is, Coach Darren does it. It is called being blind.